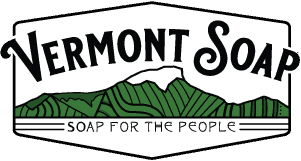 Vermont Soap developed a slow cook process and unique formula that yields a superior liquid soap base with USDA organic certification from Vermont Organic Farmers (VOF), a division of NOFA-VT. You will find our liquid castile soap to be mild, foamy, and an excellent alternative to detergent surfactants and petrochemical based cleaning products. We sell scented and unscented bulk castile soap by the gallon, in 5 gal self dispensing cubes, 50 gal drums, and in 275 gal totes. We make unique base formula custom liquid soap batches with 750 gal and 1500 gal minimums. Contact us to discuss your project. Our original and lowest priced Liquid Soap. Best for hands and feet and for astringent/oily skin formulations. Also used in Pet Shampoos. Sometimes mixed with shea butter to add moisture. This product cannot bear the USDA seal. Essential oils and botanicals must be natural but do not have to be certified organic. Front label bears a “Made with” statement as in “Made with Organic Coconut Oil” and a certifier statement from VOF below your company contact information. A luxury Liquid Soap that is milder and more moisturizing than the Standard Base. Harder to wash off so may be less suitable for cleaning or all-purpose products. Premium luxury formula is extremely mild. Gentler than the Extra Virgin High Olive Liquid Base. Excellent for all over body use.